Are tents money? | How can we work together to move forward? 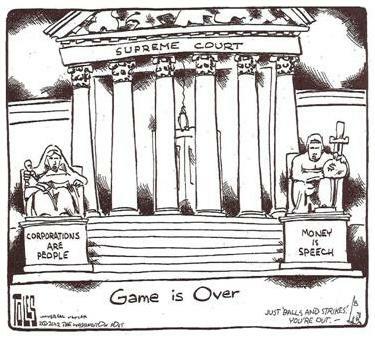 The US Supreme Court has recently held that campaign contributions – used by corporations, lobbyists and political action groups (PACs) to influence government affairs – are the equivalent of free speech; while reaffirming that corporations are entitled to the same rights as people, including free speech. Ergo money = speech. By the same logic, aren’t the Occupiers’ tents a form of speech? You’ve made an interesting comment. Could you please clarify what you mean by “the new war”?